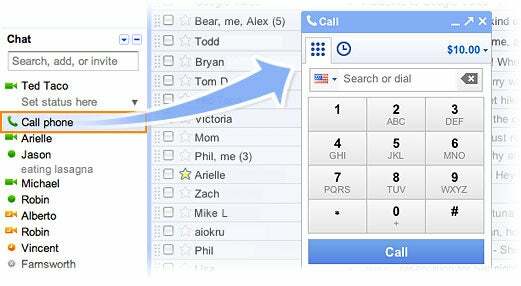 Google has expanded the functionality of Gmail by adding new voice-calling capabilities a' la Skype. The new feature lets businesses turn PCs into VoIP-enabled phone systems for more efficient and cost-effective communications. Gmail users based in the United States can now dial other Gmail users, as well as land lines and cell phones directly from Gmail. The Google Talk voice and video browser plugin is required for the voice calling feature, so it is a prerequisite that it be installed before you will be able to take advantage of voice calling. Obviously, engaging in a voice call requires the ability to both speak to the other party, and hear what the other party is saying. Therefore, you must have a microphone and speakers available. Most--if not all--laptops have built in microphones and speakers, but for desktop PCs you will need to ensure these items are installed, or use some sort of headset with a built-in microphone. Google is still rolling the feature out, but if it is available on your Gmail account, you will see a "Call phone" button on the left side of the Gmail screen under the Google Talk sidebar. Click on the button and a number pad will appear to allow you to dial whatever phone number you wish to reach. For now, Google voice calls within the United States are free, while international rates start at two cents per minute. Google has stated that domestic voice calls will remain free through 2010, but beyond that things may change as Google figures out how to monetize service if it catches on. Organizations that rely on Gmail for e-mail communications, and make use of the various other Google Apps for general business productivity can immediately realize the benefits of this new service. The service is integrated with the Google Address Book, so calls can be placed by simply typing or clicking on a contact name rather than having to look up and manually enter the phone number. For users or businesses that also have Google Voice, the two services integrate for additional functionality. Call recipients will see your Google Voice number displayed on outbound calls, Google Voice calls can be configured to forward to the Gmail Voice Talk feature, and Google Voice users can screen calls while callers are leaving a voicemail. It's a new service, so there are bound to be some growing pains for Google as well as a learning curve for users. Google will most likely modify the service, or improve the functionality as time goes on--perhaps to introduce more cost-effective calling plans, or expand voice calling internationally. The service is a direct challenge to Skype--which recently announced an upcoming IPO. Google has trumped Skype by offering free PC-to-land line calls, but things are just getting underway. As Google and Skype, and any other VoIP competitors gain momentum, I am sure there will be more innovation and aggressive marketing to try and establish dominance.